Never mind Valentine's Day, today the only love I'm posting about is the love of BOOTS. The search for the perfect pair of boots is a quest most of us embark on at some point in our lives. For me, the Holy Grail has been a pair of black, knee high, leather boots. This may sound like an easy task, but let me add in a few other descriptors for my ideal boots: 1) They have to fit my slim calves well, avoiding the 'welly' look, and 2) They have a nod to '60s style with a platform sole and heel. The hunt for these ideal boots has seen me purchase a few pairs of past season Clarks from Ebay - no joy there, it seems a thin sole was all the rage a few years ago - and take a gamble with several pairs from Zalando, including brands Gabor and Rapisardi. In the past I'd heard of British brand Ted and Muffy (formerly Duo), and knew that they offered different calf sizes. However, a quick visit to their website confirmed that their boots were out of my price range, with their knee high boots starting at around £225. I forgot about them for months and months to be honest. Then, this January, I visited their website once more, to find to my delight they were holding a 70% off sale! Now that's my kind of discount. I found I was spoilt for choice with a range of really rather lovely knee high boots, and it wasn't long until I found their 'Cosima' style, and a ray of golden light shone down upon my computer screen as I clicked 'Buy'. Originally £250, I purchase them for £125. Bag: From on hols in Spain! The quality is very, very good. The softest leather. Fully lined. The smell when you open the box and dig through those layers of tissue paper is wonderful. As for fit? These are the best fitting boots I've bought in quite some years. Being really critical, they are indeed very snug on the calf, but the leather will ease. On my long legs they could be even taller. They are not quite as well fitted at the ankle, but it does mean the range of movement is non-restrictive. In terms of comfort, they're just brilliant. I broke them in around the house for an afternoon wearing nothing else and then wore them to work one day. The walk to the station was a breeze, with my legs staying dry, high up and out of the puddles. No rubbing or sore spots. They are sturdy, and I can run in them when I'm late for the train. They are 95% perfect! I bet if I was to visit one of the Ted and Muffy stores I could come away with a pair of boots that fit me 100% accurately. The closest one to me is in Bath, so I think I'll pop in next time I'm visiting the city. What is your personal boot Holy Grail? And have you found it yet? Big hugs & joyful Valentine's wishes to you and your honey! I tried to buy a pair of boots from Duo a few years back (heavily discounted, of course. - full price, they are too expensive for my pocket) but sadly they didn't fit well at all, despite all the measuring, and I returned them. Yours look lovely, I'm glad you got a good fit, and you look fab in your 60s-style dress! You and I have polar opposite issues. I've got "man cows" and you've got baby calves. You look super confident here. Very 1960's. I did find a pair of Italian boots about 8 years ago at TJ Maxx that are still probably the most comfortable boots I own. The leather is very soft and they have just the smallest heel with a rubber flexible sole. They weren't cheap, but their cost per wear would be zero now. I wish I could find another pair as these are showing their age. Ooh, let me know if you're swinging through Bath, we can meet up. 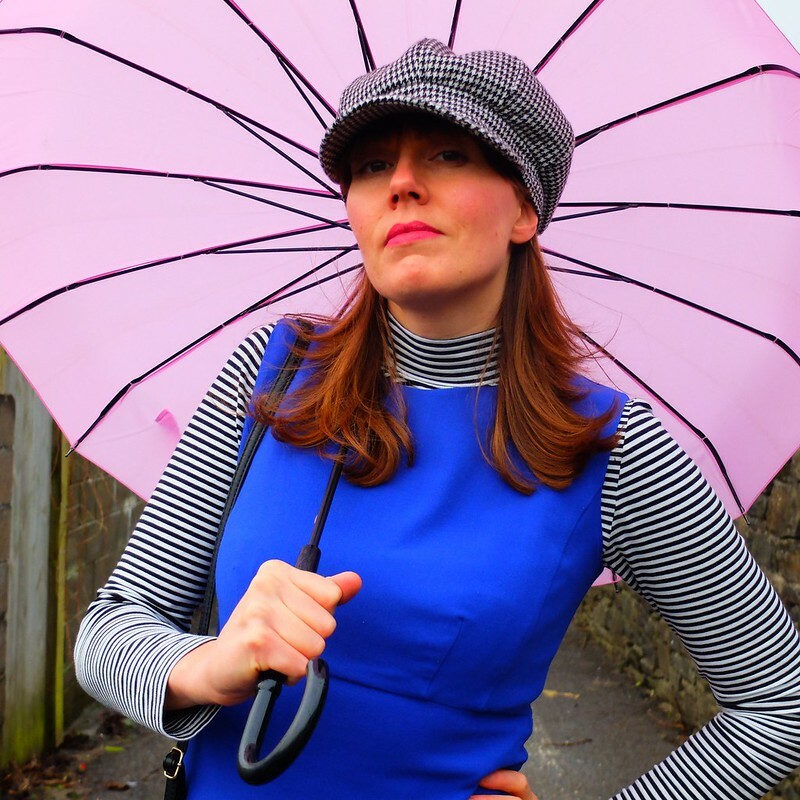 I was wondering if anyone fancied meeting up for Bath In Fashion's vintage weekend. My friend Lucy is the merchandiser for T&M, and all their stuff is good quality. She's got some amazing boots. 18-24 April - they haven't put up final details yet, but the vintage weekend usually comes at the end of the whole thing. These boots look incredible! 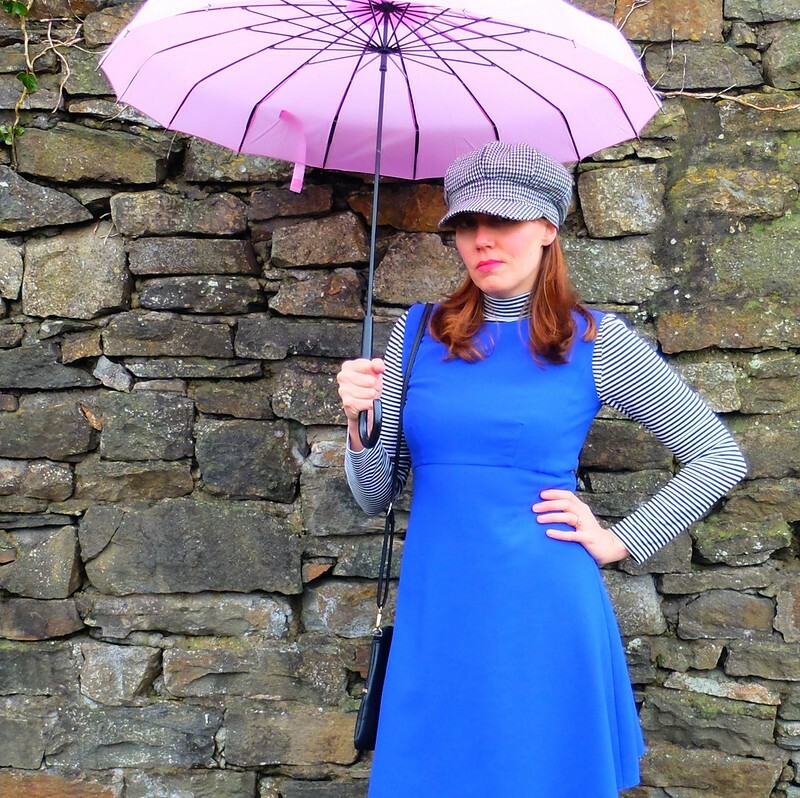 Perfect for your 1960s look for this outfit! Amazing dress - I love the color! Hooray for finding the holy grail of boots! They look great with your blue mini dress and fit your legs a treat. 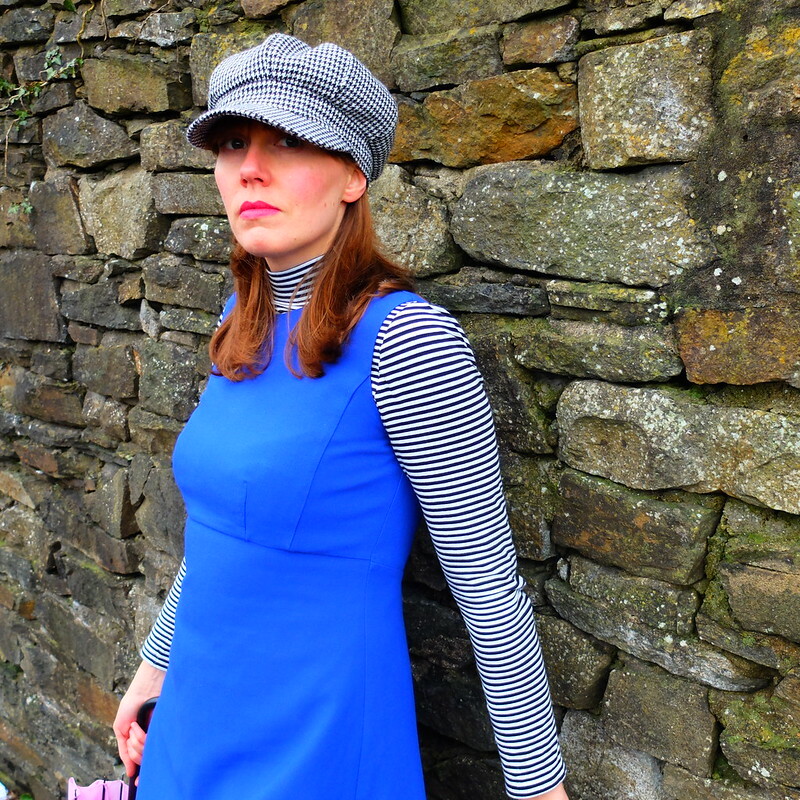 Loving you as a mod girl! 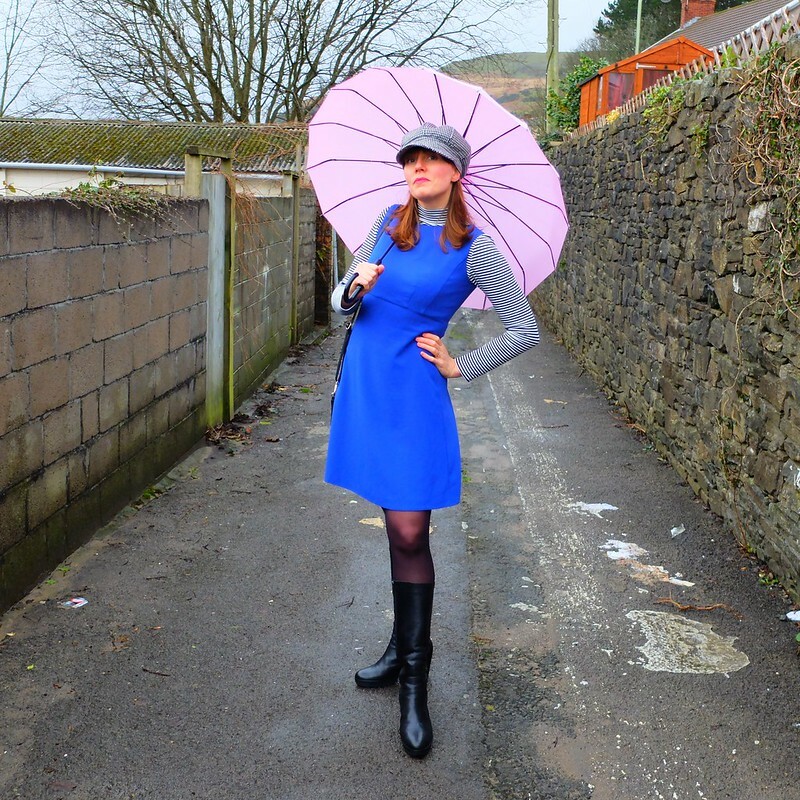 The boots are stellar, and the shift dress/turtleneck/cap are all working like gangbusters. Seriously, is there's anything you can't pull off? My holy grail right now is a pair of high waist black pants. I got a pair from Freddie's of Pinewood that I had really high hopes for, but they're really tight in the calves and then loose in the waist. If it was one or the other, I'd probably call it a win, but as it is they don't look right at all. Hopefully one day soon as I get as lucky as you got with your boots. Great boots! I'm sure that boots really shouldn't be so hard to find but they really are. I have trouble finding any that accommodate my calf muscles without looking like wellies at the ankles! Love the '60's styling you have done here. I can hear myself singing "These Boots Are Made For Walkin'" as I read your post! These boots look PERFECT on you, the platform heel is perfect! You really are amazing at finding the best bargains! I love the '60s style outfit on you! I haven't yet found the perfect pair of boots... I'm really bad about buy shoes that are not practical...but as I'm looking forward to Spring I have already promised myself that the fall will finally be my time to by practical and stylish boots! I enjoy the design regarding boot styles yet have not obtained the particular jump of shopping for my own, personal couple. Now i'm somewhat low-cost in terms of purchasing shoes or boots.